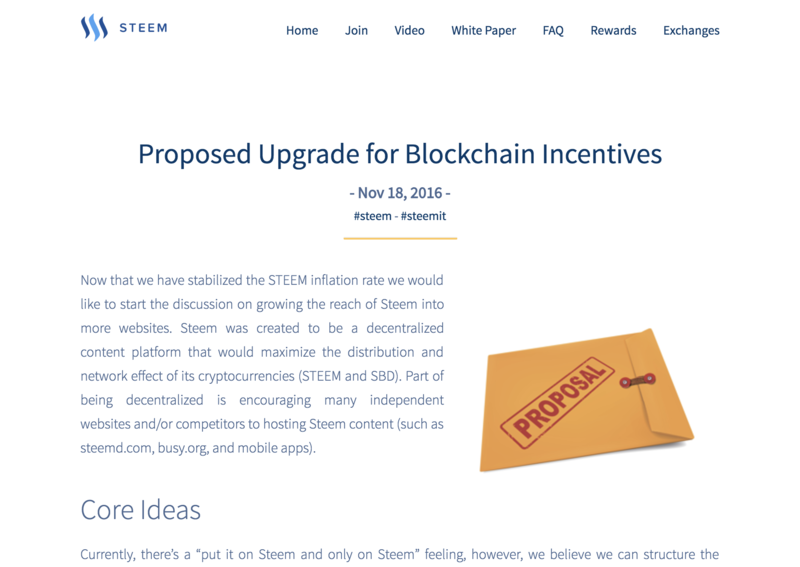 There's one specific quote I really want to dive into from steemitblog's latest post, "Proposed Upgrade for Blockchain Incentives". Links should not have extremely high author rewards because they are almost entirely requests for curation. Links as a content type (like posts) - it's something I've been thinking about for a while now, but don't see much chatter about. So I figured I'd write a little bit and potentially stir up some excitement for what this could be. I will be referring to this site as "blog.steemit.com" in screenshots and code samples, as that's what this site could potentially be someday. What would a content type of "Link" be? Think about how reddit uses in links to external content on other websites, as content on reddit itself. That's the one line pitch for this new type of content. You're taken to a reddit page, with a post someone wrote in a subreddit, it's comments, and other related information. You're taken off reddit to an external website. Posts here on steemit are what we have now and are just like the first type above. 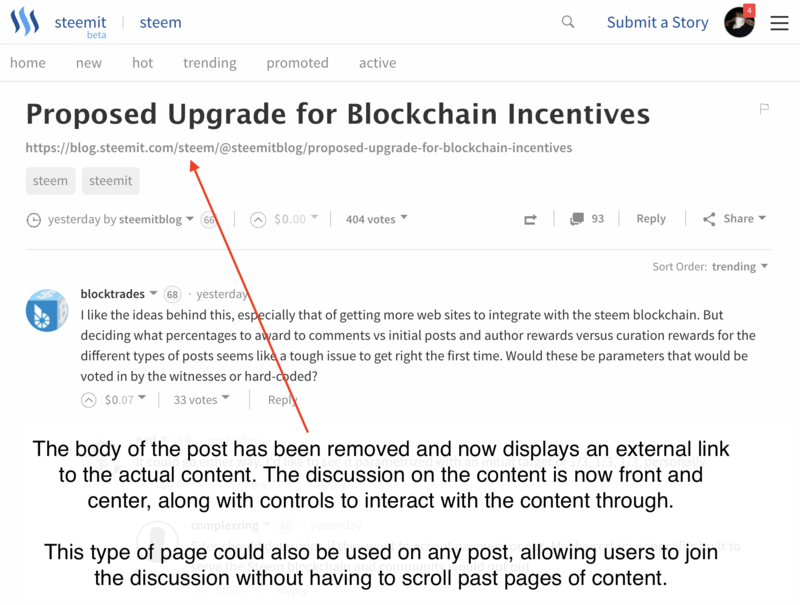 The "link" content type that could be added to steem/steemit would be like the second type above, and act as a way to share content that is off steemit.com. The content could be on any website, even a website powered by steem, or a website powered by a different blockchain. How would a user submit a link? Instead of "Submit a Story", you would "Submit a Link". When submitting a Link, it would be similar to submitting a story, except the post of the body would be replaced by a field for you to enter the link. The remaining fields (tags, title, maybe payout options) would remain the same. Any link could be submitted by this method, but one of the cool things about how this could be implemented is that any content created on steem (as a post) could automatically act a link as well. Before diving into that concept, we need to understand what makes a "link" on the blockchain. How would it work (technically)? Right now, links could be implemented as a content type simply by creating a comment and specifying a link within the json_metadata. Links could be a comment in the blockchain, just one where a body field isn't required. They are tagged and indexed, mixed in and ranked right alongside all other content. They just act a bit differently, and may even have different reward structures (as the steemitblog article discussed). What would the experience on steemit.com be like? How would this change steemit? This is where the steemitblog/reprint example site comes into play. Imagine if that steemitblog post was submitted with the json_metadata shown above (perhaps automatically through a custom CMS). Here's a series of screenshots showing how the UX would work for that post. These aren't incredibly confusing or difficult changes (I don't think), and would offer users a new way to share content outside of the blockchain, while still creating a reference to them on-chain. There are some technical considerations yet to make about rewards, posting limits, uniqueness requirements, and UX - but I think the idea has an incredible amount of potential. Earlier I mentioned that the body field of a post wasn't required, but that also doesn't mean it has to be empty. I also mentioned that content submitted to steem (the blockchain) could automatically become a link. To end this entire train of thought off, here's how that could all work. Let's say I create this post (the one you're reading), and on this post, I add the json_metadata that a link type comment would have (the origin parameter). The link I use is to my blog, jesta.us, and is specifically to this article (like this example. The attaching of this json data would happen automatically through a CMS on my Reprint blog running on jesta.us, or any other authoring tool, as to not make it difficult. What I've created now on the blockchain is the hybrid of a comment and a link. On my website, I now have a post displaying like any other post. But on steemit.com, it now is automatically displayed as a link, which people can upvote, comment on or click on to visit my website. This one blockchain entry, as read by two different website engines, acting completely different based on the site it's presented on. Just to wrap this up, I believe content types could offer huge opportunities for development around steem. Not steemit.com, but steem, the blockchain. Steem itself has an incredible potential to become a shared foundation, for an unlimited number of websites, all interconnected by people in a way we've never seen before in history.